It’s not uncommon: Travelers come to Antigua, fall in love with the cobblestone streets, gorgeous old ruins, and cosmopolitan restaurants, and never want to leave. And that’s fine, except that there’s so much to see beyond the city’s borders. Here, we’ve compiled a handful of great day (and half-day) trips, as well as slightly longer excursions, that you can do using Antigua as a base. Climb a volcano, bike through the Antigua valley, head to the jungle to explore an ancient Mayan site or visit the highland lake of Atitlán and its small indigenous towns. Get out and explore—Antigua isn’t going anywhere. Antigua is based in a valley surrounded by lush coffee farms, tranquil mountain villages, and towering volcanoes. The verdant hillsides provide incredible views, as well as great terrain for hiking and mountain biking. 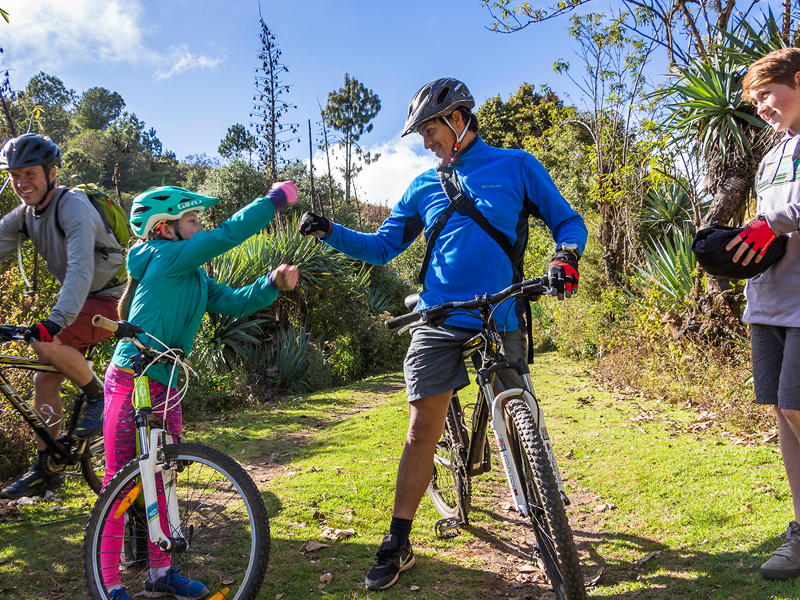 Grab a guide and head out on a mountain footpath or bike along some of the local back roads to get a taste of daily Guatemalan life. You’ll see everything from bustling markets and beautiful churches to cloud forests and myriad bird species. For the best views, start your tour in the morning, when skies are clearest. Guatemala’s home to more than 30 volcanoes, a handful of which are known to spew a bit of ash, smoke, and lava from time to time. One of the more popular volcanoes for climbing is Pacaya, about an hour-and-a-half from Antigua. 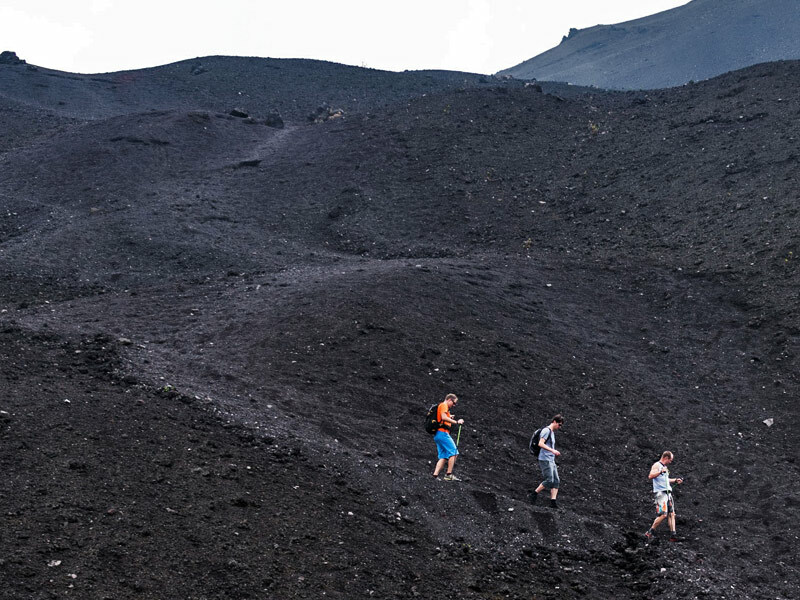 A guided hike of Pacaya (which is active) will take you along its foothills, up through pine forests, and to an area of lava rock and ash where you’ll see hot steam escaping through crevices in the ground. On a clear day, you can expect views of nearby volcanoes, the Pacific lowlands, and as far as El Salvador. 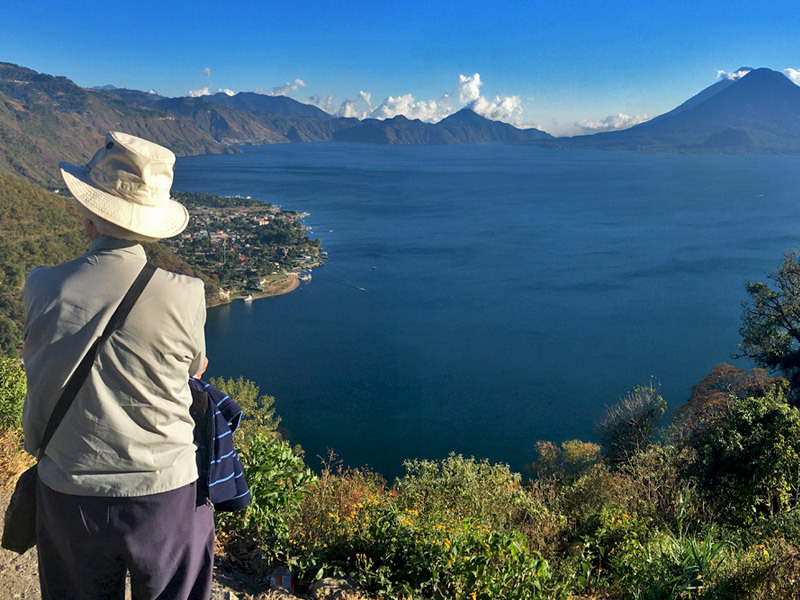 A two-and-a-half-hour drive from Antigua, Atitlán is one of Guatemala’s main attractions. A highland lake formed from a volcanic eruption some 84,000 years ago, it’s surrounded by three giant volcanoes, myriad indigenous villages, and rugged swaths of rock and wilderness. The town of Panajachel is Atitlán’s main hub though a visit to some of the lake’s other villages is a must. Hunt for ancient Mayan caves in San Jorge La Laguna or take a lancha (a small motorized boat) to San Juan La Laguna where you’ll find gorgeous, naturally dyed textiles and traditional artwork. Be sure not to miss Santiago Atitlán, a traditional Tz’utujil Mayan town where you can track down the local shrine to Maximón, Guatemala’s cigar-smoking, liquor-swilling idol. From Antigua, a transfer by car to the Guatemala City airport and a 45-minute flight will deposit you in El Petén, Guatemala’s most remote and least-developed department. Here, you’ll find the dense rainforests of Tikal National Park, as well as the impressively restored ruins of one of the ancient Mayan’s largest civilizations; there are soaring temples, grand palaces, and large open plazas. A UNESCO World Heritage Site since 1979, Tikal is also home to an impressive array of wildlife including howler monkeys, three-toed sloths, red macaws, and Morelet’s crocodiles.